Building on the skills of Foundations of Improv with a concentration on creating strong scenes. $25 Discount if you sign up more than 7 days in advance of the first class. An exploration of different Long Form structures. Each 6 week session will focus on a specific form in-depth, giving insight into the ins and outs from the intro, to scenework, to group games, and more. Students will then have the opportunity at the end of the session to perform in their very own show and put their skills on display! This class culminates in a final performance immediately after the last class. It's showtime! Your first foray into short form improvisation. This 6 week class will immerse you in the Laugh Out Loud style of ensemble-based improvisation and give you the gameplay foundation necessary to put on your own improv show! Whatever your background, improv is for you! 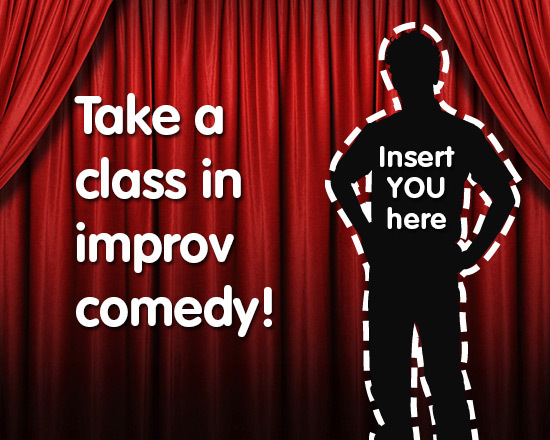 Whether you're a barista or an accountant, an aspiring actor or a stay-at-home parent, our improv classes can enrich your life and help unleash your inner creativity. Our program begins with an introduction to improv and scenework, and then splits into 2 streams of instruction - one focusing on short form improv, and the other on long form improv. Take one, or the other, or both. Sign up today!